My current project involves 3 colors, and boy does that one extra ball make me feel like a juggler! It's hard enough with trying not to get 2 balls of yarn tangled up, despite keeping one on my left and the other on my right. It's a whole new ballgame when you add ball #3. 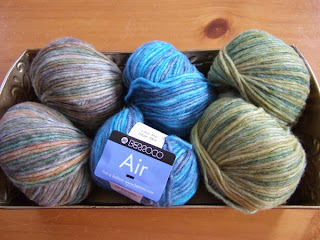 Has anybody knitted with Berroco Air? So I've decided to play around with my ball of Air which meant digging out my US11 (8 mm) straight needles. I haven't used these needles since Nov 2004. It took me a while to figure out where they were, of course they were buried at the bottom of one of those big plastic 12(?) gallon storage bins. They're 14 inches (35.5 cm) long. Omigosh, I couldn't believe how cumbersome it was to work with such large and long needles!!! I think I spent more energy trying to hold the needles up than in actual knitting. 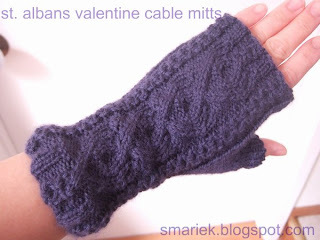 Plus I think I have been "handicapped" by knitting with circular needles. Yes, I use circular needles for all my knitting, both straight/flat stuff like scarves and round stuff like hats. Do you know what happens when you're handicapped? You end up dropping the left needle each time you finish a row!!! It's actually quite funny when I think about it now, but not so funny when I actually do it. Anyhowz... 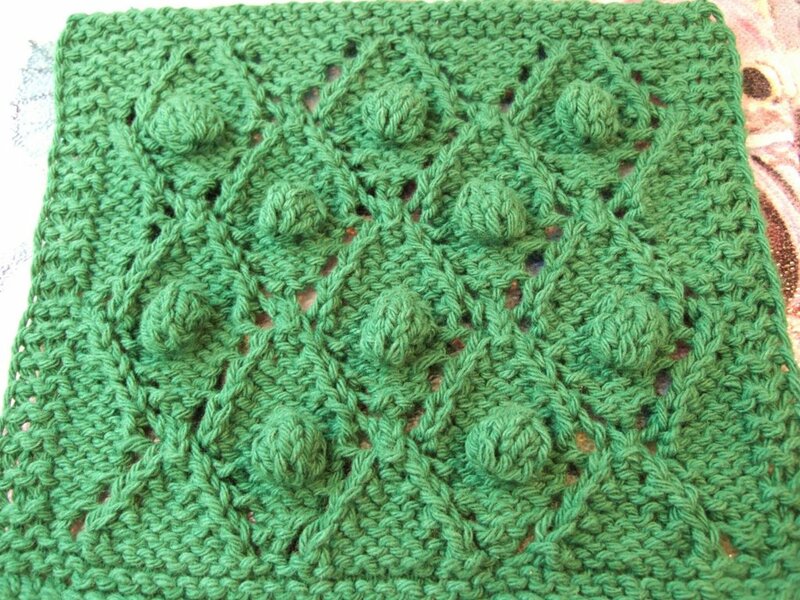 I don't know what it is about Air, but I had to frog what I was working on several times already, and the yarn is just "sticky". It sticks together and gets tangled up. I can't just leave the loose (frogged) yarn lying next to me; I have to wind it back up into a ball, otherwise it gets tangled up. Still playing around with it. I'm surprised at how light this yarn is, which I suppose is why it is called "Air". I'm thinking my US11 needles might be too small, and I should really try US13 (9 mm) which I have none. I do have one pair of never-used US15 (10 mm) circular needles which I had intended to use with Reynolds Blizzard, but never got around to it. I think Air should be warm with 78% wool in it. Well here's what I've got so far, it's not much to look at right now. Haven't decided whether I like it. I really do NOT like using straight needles. And I find it harder to use large US11 needles. I think I've just gotten used to medium size needles. And I'm slightly annoyed that my regular sized row counters don't fit on the needle. 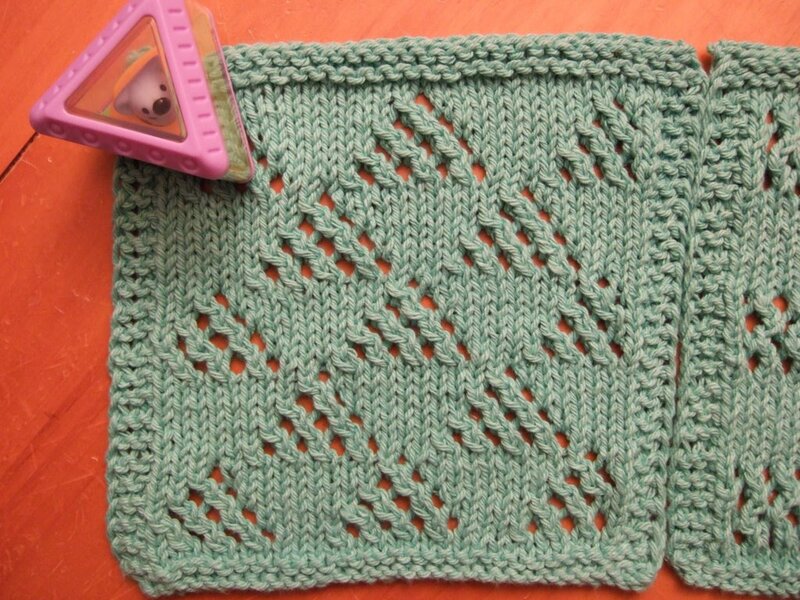 I never bothered to get the larger sized row counters because I didn't think I'd ever use such large needles ever again. 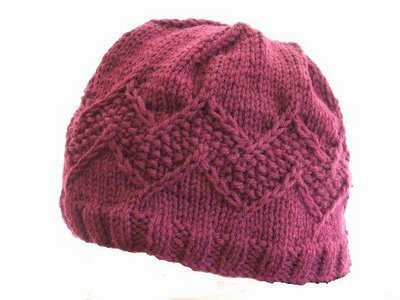 What do you get when you try to knit the Oblique Hat with 2 leftover balls of yarn and run out of one color just before the decrease? 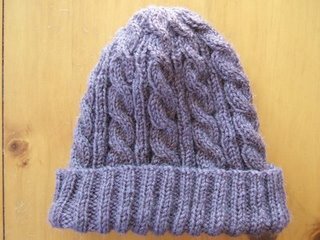 I started out with 2 balls of yarn which were about the same size and I thought I had enough to make this hat... but I guess one ball was more densely wound and the other was more loosely wound cuz I ran out of the blue. 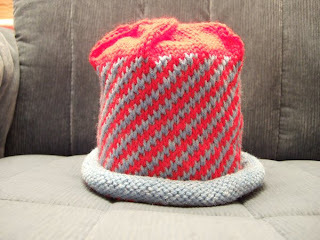 I was getting worried about whether I would have enough red left, so I skipped some of the knit rounds in the decrease. Good thing I did that because I definitely would not have had enough yarn left over. It was very very close. This is chemo cap #16 for Cap Karma's 2006-2007 season. 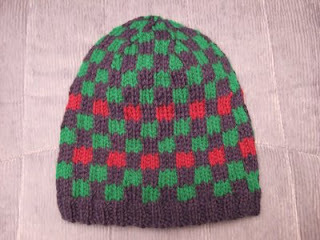 I think this hat shows off the diagonal pattern of the Oblique Hat so much better than the photo you see in the pattern post. 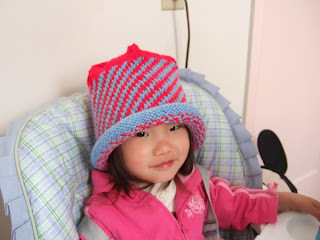 When M saw the hat in the morning, she decided she wanted to put it on. 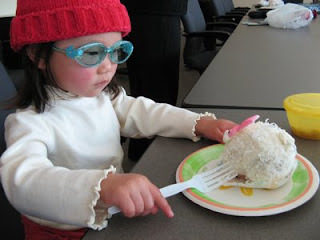 When I did that, the hat covered her entire head down to her chin, LOL. She lifted it back up and then I decided to take a photo of her with the hat on. It actually came out relatively in focus. It's always a challenge for me to take photos of moving objects, and toddlers do not sit still! Here's the pseudo pattern for the Jewel Cross Rib pattern found in BW2 pg27, although I doubt anyone would want to work this pattern. 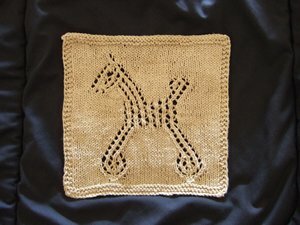 Using WW yarn and US7 needles, cast on 42 stitches. 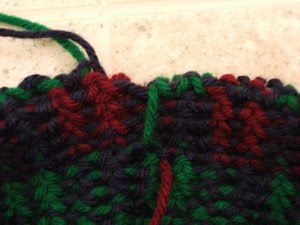 Maintain 3 stitch border on edges. Repeat Rows 1 to 10, 3 times. M and I had quite an adventure last Friday when we went to the San Francisco International Airport to meet many of the other knitting ladies in Cap Karma. We met in a TSA conference room (which they call their "lunch room"! 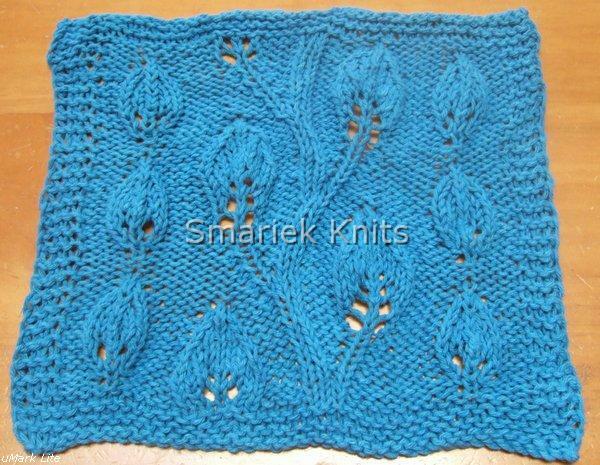 ), which was large and spacious for us to spread out our knitting. It was great to meet these ladies I had known only by name or by photos of their knitted items. And what a bunch of talented ladies they are! In the photo below, you can see many of the chemo caps that were made for Cap Karma; these hats are going to chemo patients in local hospitals. V brought 3 shopping bags full of caps so everyone could see. Since all the caps get sent to her, she was the only person who really saw all of them. 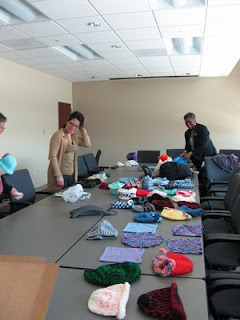 This get together was a nice opportunity for us to see what everyone else had knitted, and also share ideas & tips. Yes, we can see all the caps on the Cap Karma blog, but it's so much better to see the caps in person, confabulate amongst ourselves about the cap designs and share knitting tips. 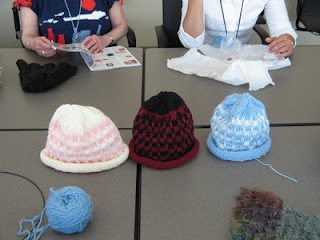 There were also some hats knitted for the Ships Project; these hats will go to our troops. 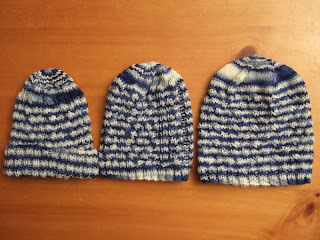 Here are three Striped Slip Stitch Hats, each knitted by a different person. Aren't they cute? 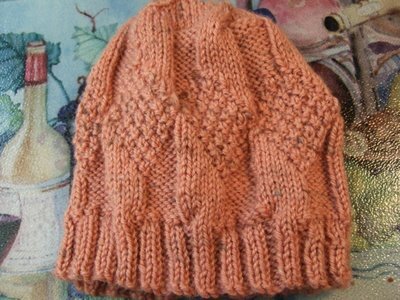 It's neat to see how the hats turn out when knitted by different people. 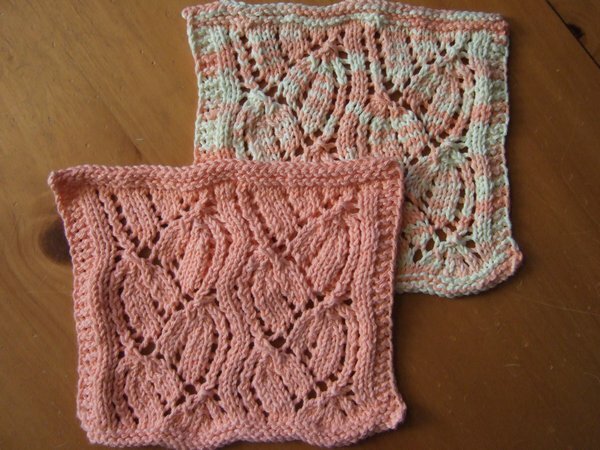 Somebody (sorry, I forgot who made the comment) said that she couldn't believe they were knitted from the same pattern. It wasn't just all about caps. 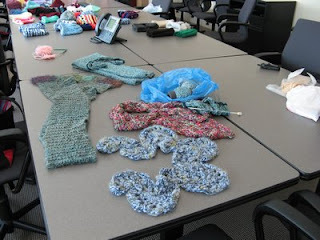 It was show & tell for other knitted items too. There was a great pair of socks too, but I don't think we got a photo of that. This is a green shell that is being knitted with some novelty/luxury yarn which I forgot the name of. V was really smart to bring a little bunny treat for M. M loved it, and it kept her occupied and quiet for most of the time we were there. I guess I should mention that M is not one of those toddlers who will play quietly in a corner with her favorite toys; she likes constant attention. I keep forgetting to mention this, cuz I'm not always thinking about diapers when I'm in front of the computer. I have another two codes for the Pampers Gifts to Grow program, combined they are worth 5 points. Email me if you are interested. Sorry, haven't posted in a while. 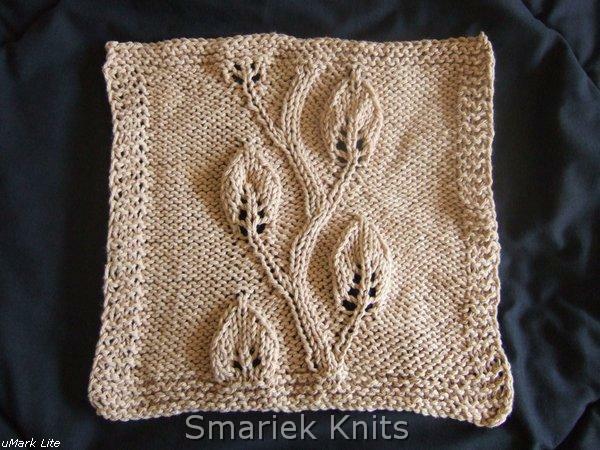 Have been busy on this end, and unfortunately it has nothing to do with knitting. :-( I've given up knitting in the car. It just isn't happening anymore. M is getting more nap resistant. I end up spending my time driving, but little time parked knitting. 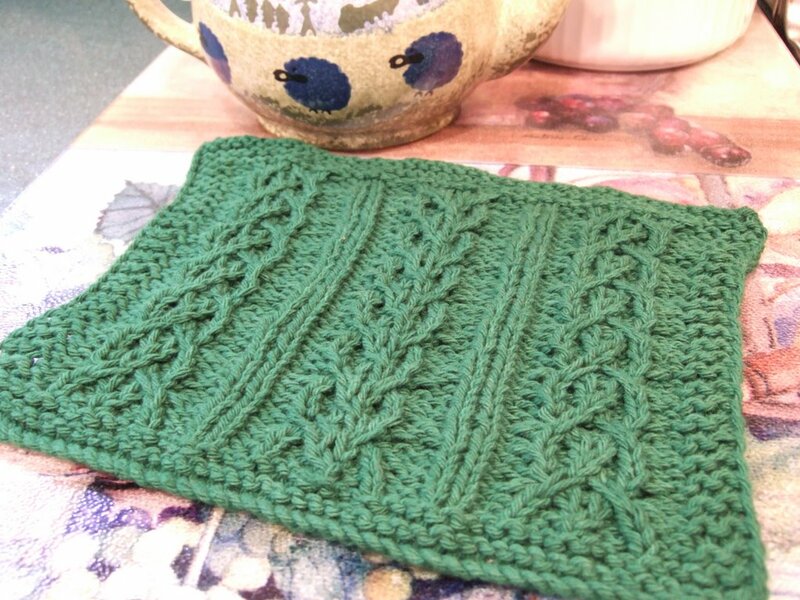 Limited time for knitting in the evenings. And weekends are go go go with getting M to her Musical Lapsit, catching up with house chores or errands, driving an hour away to look at Open Houses (which tires us out by the time we get home, and requires slightly more planning with a toddler in tow), and driving an hour away to visit the inlaws. Yeah, that pretty much sums it up. I'm currently in the (heinously slow) process of converting patterns to PDF. Despite being a relatively simple task, things move slowly in this house and I have a whole process for this which takes me several sittings to get one done. 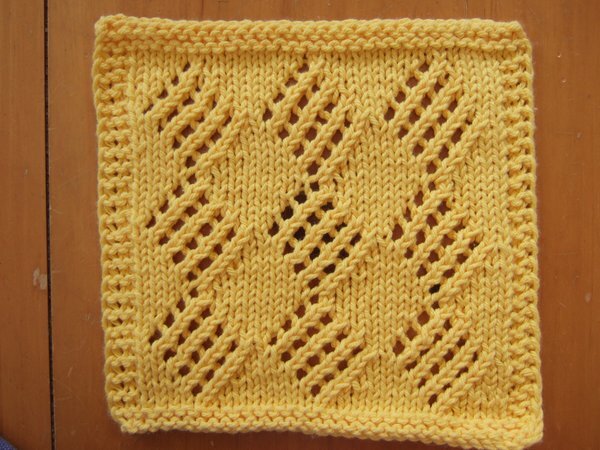 On the upside, this switch will allow many people to print just the pattern without all the extra "fluff" that appears on the blog. I understand that printer ink is very expensive, and that many printers are ink thirsty. Of course it could help to print in plain black & white too, in order to save color ink for when you absolutely need color printouts. I just finished a 2-color hat so I could free up my needles when I go visit the knitting ladies at the San Francisco International Airport tomorrow. These are the ladies who knit chemo caps for Cap Karma. I think some of them are interested in learning how to knit hats in the round using 2 circular needles. This will be an interesting visit with little M in tow... she's not much interested in knitting at 2 yrs of age, other than pulling on my needles or yarn. Then she'll say, "mabm mabm," which is (what I think is) her way of saying, "this is OK to do," or, "I'm wanting this to be OK to do." 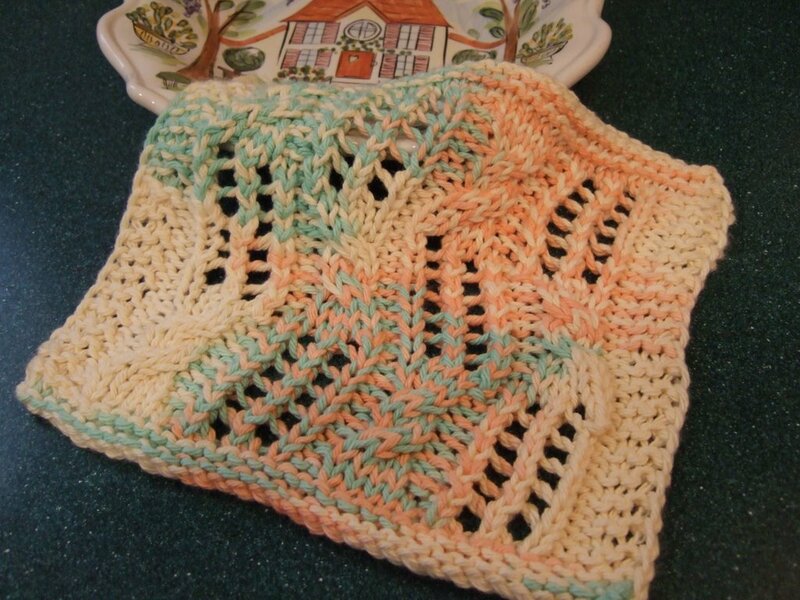 I have been disillusioned about posting free patterns on the internet. It's not such a long story, but I won't post the gory details here. 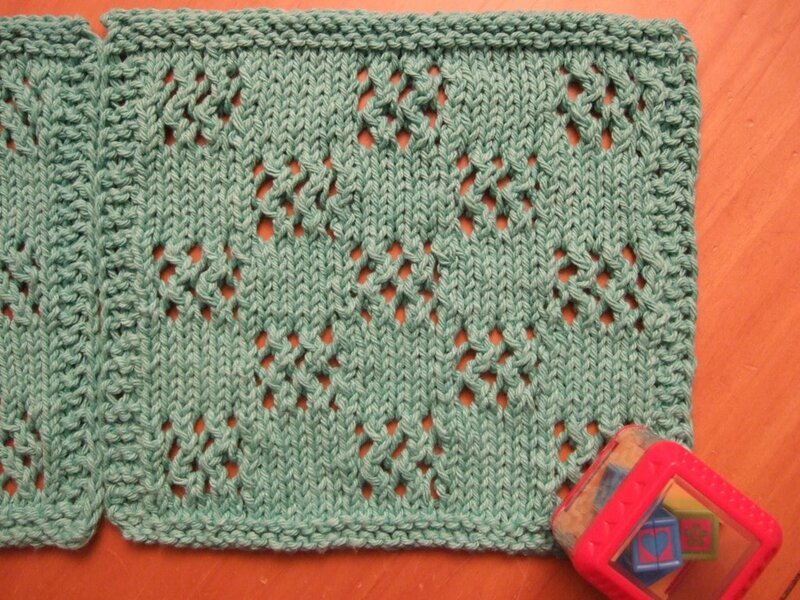 However the result of this is that I am having antithetical thoughts about posting new patterns on my blog. 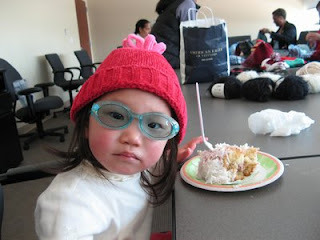 I was taking some photos of little M one day and noticed that I could only take a limited number of photos because the memory card was running out of space. 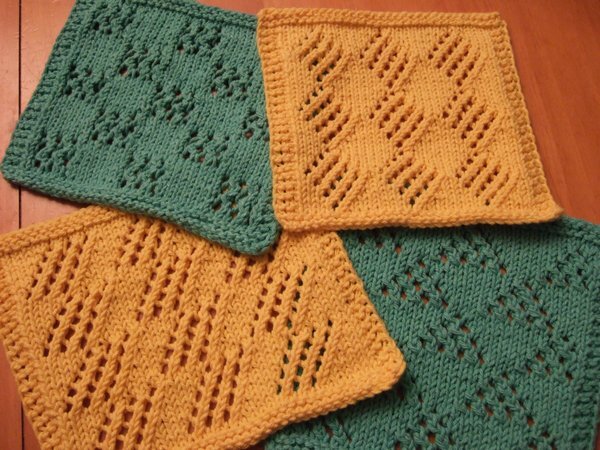 So I went back through some photos, saw some knitting photos, thought I had already downloaded them, so I proceeded to delete them to free up space. 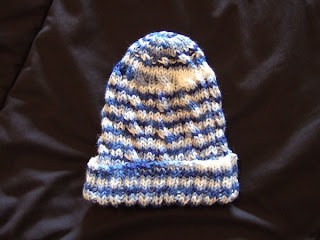 Then I continued taking photos of little M.
Mary wrote: did you ever get a knit-in-the-round version of this hat pattern? 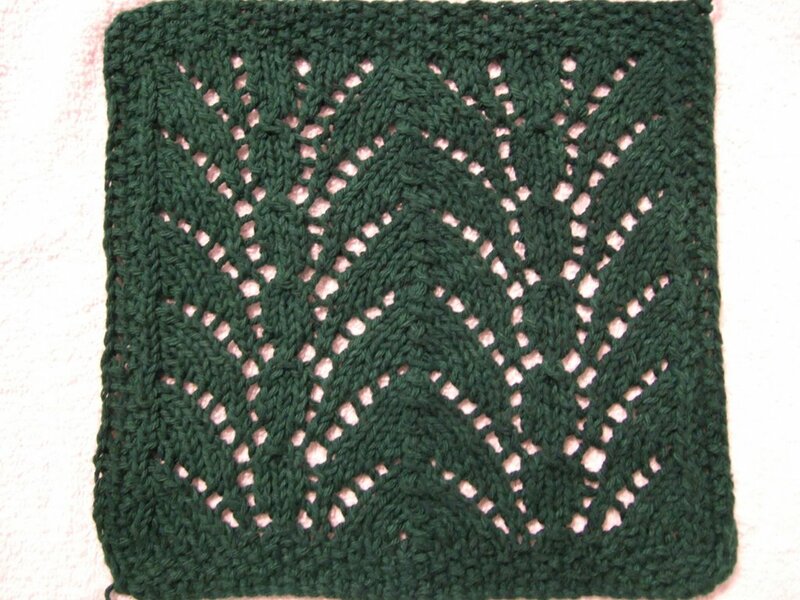 ... Are the "LT" and "RT" stitches what make the zig-zag border around the seed stitch? (This is referring to The Claudia Hat) Yep, you got it! That's exactly what the LT & RT stitches do. 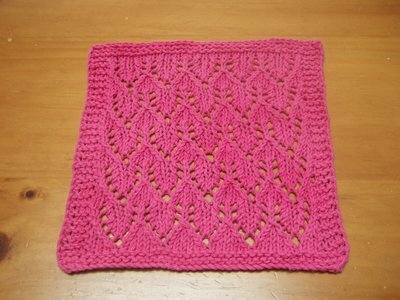 Sorry, I haven't played around with converting this pattern for knitting in the round. I know what you mean about seams though. 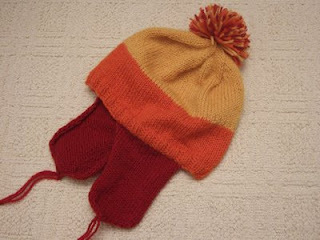 After working that hat, I know I will try to avoid flat knitting a hat. Madeline wrote: Personally I am having other Reader issues-- specifically the document downloaded fine and suddenly the text warped into something unreadable. It's not the first time for me and I'm trying to figure out what's up. Don't know what to tell you about trying to view PDF files. In the process of PDFing the files, I punted the blog text into a Word document, tweaked the format (funny how copying/pasting from one place to another will invariable screw up how something looks) & rearranged things, then saved it as a PDF file. Would it help if I offered the Word document version? 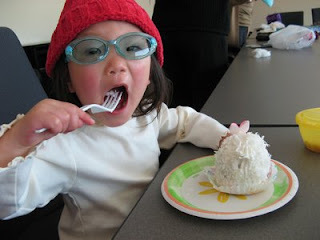 I've been playing around with offering the PDF files as downloads from Quicksharing.com (Thanks Hakucho! ... for pointing me to this site). It seems to do what it advertises. I suppose I could upload the Word documents there as well. Another thing I had in mind is to do what many other people do for sharing their files, viz. using Yahoo Groups. Although I have played around with creating a Yahoo Group, I haven't yet decided whether I really want to go that route. 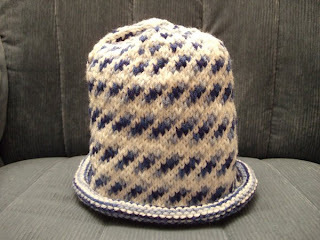 I actually saw a high school student wearing a hat with this pattern, hence the name Passerby Hat. 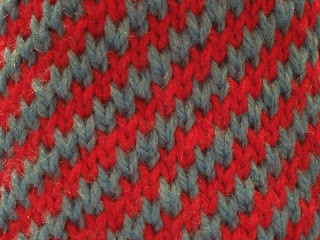 The pseudo-pattern below is based on what I saw during the 3 seconds I saw her hat as we walked past each other while walking down the street. 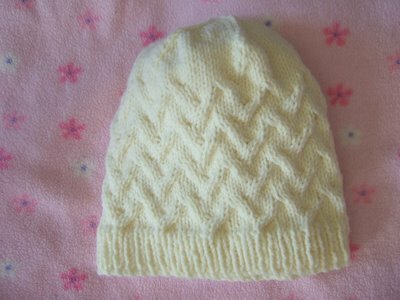 Her hat was a light cream colored hat so it wasn't too difficult to get a good look at the pattern in those few seconds. 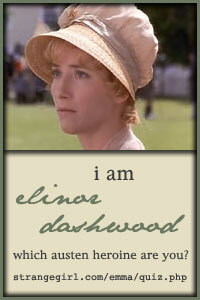 What I loved about her hat is the big fold up brim ... 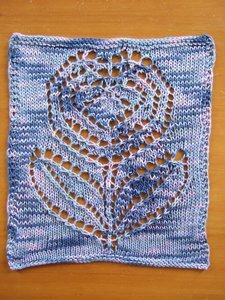 I'm thinking, this is a GREAT way to use up all that blue variegated yarn. 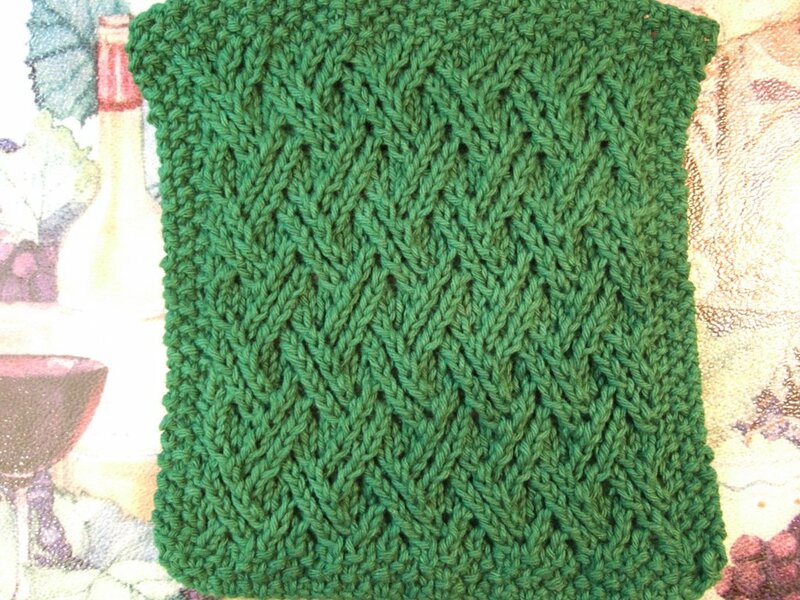 Sorry, it's not very easy to see what the hat pattern looks like with this yarn; It'd look better in a solid. And yes, it's another poorly lit nighttime shot too. Please read "Notes" section before starting; it contains almost everything I think you may need to know to work this pattern. I think the only thing I haven't defined is "K2 P2 ribbing", you can email me if you have questions about how to do this. 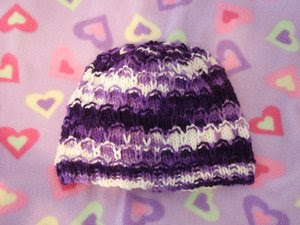 This hat is knitted in the round with circular needles. WW yarn. US8 (5mm) needles. CO 96 sts, join in round. 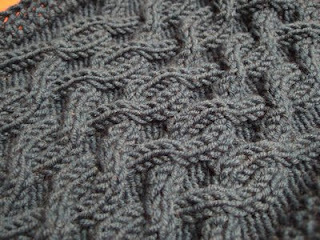 Work K2 P2 ribbing for about 5 inches (~12.5 cm). 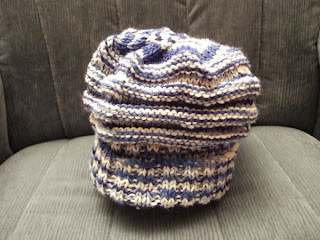 Part of this is the fold up brim, adjust length as desired. Repeat rounds 1-8 until desired length (learning towards longer as the decrease section is pretty short). 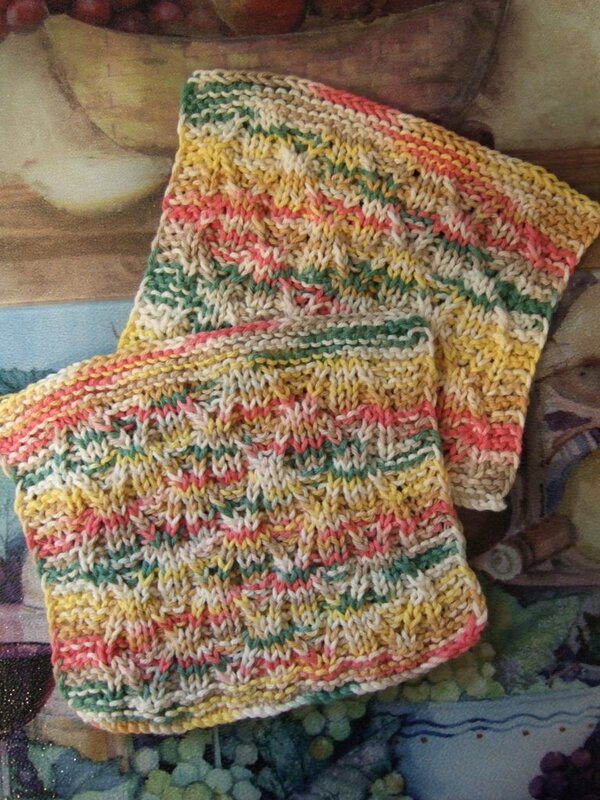 Cut yarn, thread through remaining stitches and fasten off. Weave ends. 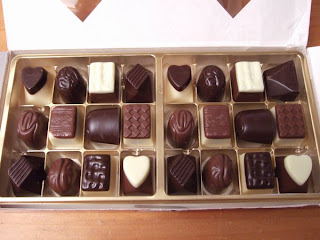 I got this from Grace. Check out her blog, she does beautiful work! 45. 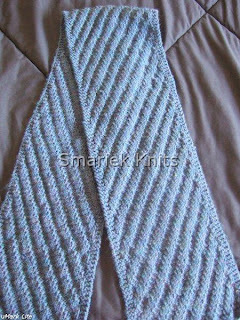 ** Big Book of Knitting Stitch Patterns by Inc. Sterling Publishing Co. The game is called "Guess Who's Coming To Dinner"? 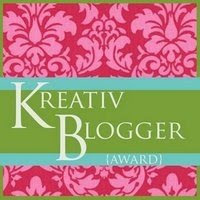 Three Bloggers are tagged and must post on their blog these directions and list the names of 6 of their favorite renowned Knitters whom they would invite to dinner and their reasons why. Then the Bloggers play it forward by INVITING 3 new Bloggers play the game and name their Fantastic 6 for dinner. And so on. Well, whadya think? Is it gonna be a lively party? Or a bore? Does it give you any clues on where my true interests lie? Thanks for the input. I gave it a try and saw what you meant. So I've added step-by-step instructions for downloading the file from Quicksharing.com. Let me know if this helps. Oh, I looked at the PDF file again this morning and realized that any URL links are lost in the document. :-( I really like having the links to specific definitions on KnittingHelp.com or links to definitions of yarn weight & needle size on YarnStandards.com. 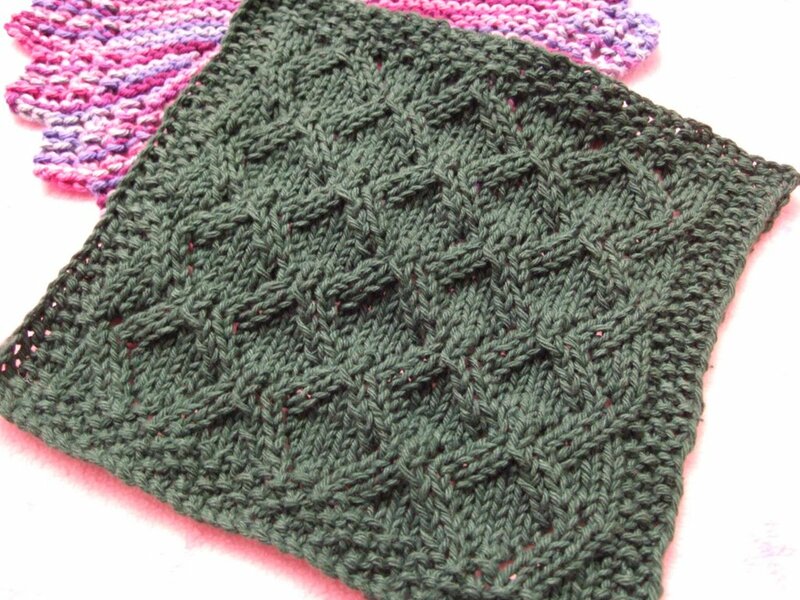 (There aren't too many in my Persephone scarf pattern, but I have other patterns which have a long list of abbreviations.) I know most people don't need these links, but I would like to keep the links in there if it will help just one person out there who needs that extra info. You know? So, does anybody know how to get links to work? Or do I just have to type out the URL and people will just have to copy/paste the location into their browser? I'm in the process of trying something new with my patterns. I'm going to offer them in PDF format for several reasons, some of which include ensuring you get the complete pattern instructions with pattern notes and making it possible for you to print out just the pattern without all the extra "fluff" on the blog page. 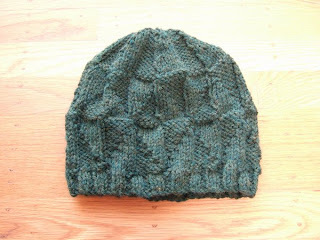 Last month, I learned about the Ships Project -- an effort to knit hats & other stuff for our troops abroad -- from Patricia and discovered that 4 of my hat patterns are listed on their Approved Patterns list. I guess many people have knitted these for the troops. 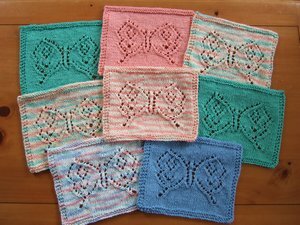 What a pleasant surprise to learn of this wonderful way my patterns are being used. 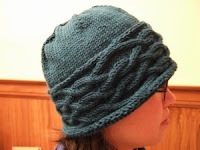 And I was really surprised/shocked to find my Claudia Hat on the list cuz that is my least liked hat pattern ... mostly due to the seaming, and it is the only one of my hat patterns that is not knitted in the round. 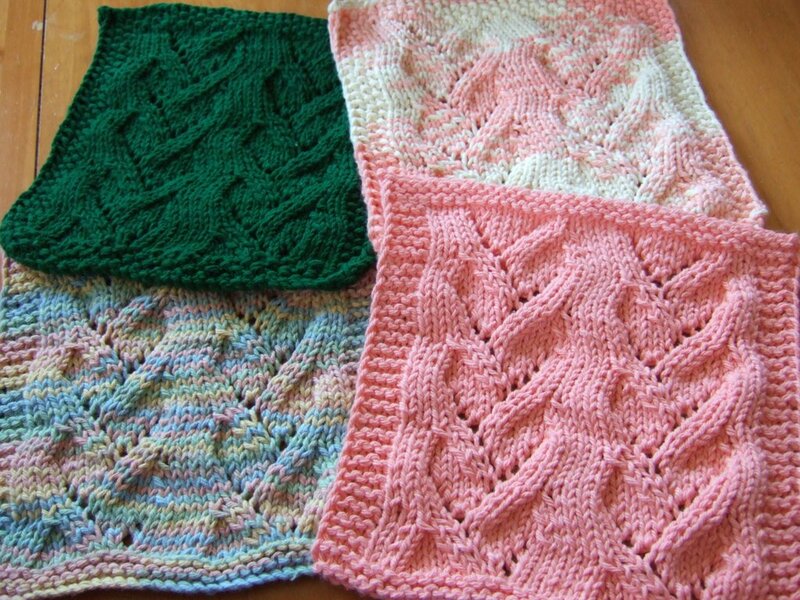 Of all my patterns so far, I have to say my favorites are: the 3AM Cable Hat, the Persephone Scarf, and Heart Lace Cloth. Well, don't I really know how to screw things up! I copied my pattern from Blogger into Microsoft Word. Spent some time rearranging & formatting how it looks. I still hadn't figured out where I could post a PDF file for people to download, plus I wasn't sure I liked the idea of trying to main two copies (the blog copy & the PDF copy) synched up, so I decided to hold off on the PDF file idea. 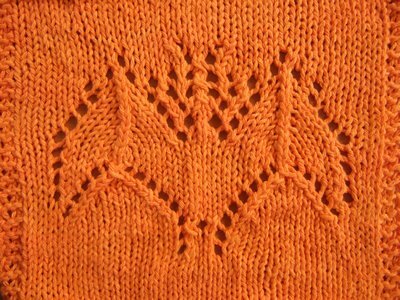 Then I copied the updated pattern from Microsoft Word back into Blogger, and of course the formatting looks all wonky... so now I need to tweak how it looks in Blogger, again. 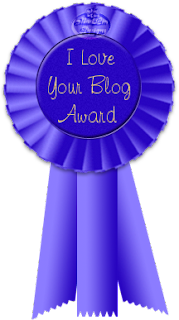 Other Blogger woes .... CatBookMom's blog has completely disappeared! It's been that way for days and she's still waiting for a response from the Blogger techs. I discovered this link from her about backing up a Blogger blog: http://www.quickonlinetips.com/archives/2005/11/back-up-your-blogger-blog/ . The first option seems painless enough. I'm not sure I want to jump through the hoops required in options #2 and #3. Ok, gotta go, the Boss needs me. I'm drinking Yamamotoyama Green Tea today. It's seems cooler today, wonder if the Boss will want some too. She's discovered juice lately, and has been requesting that by name. 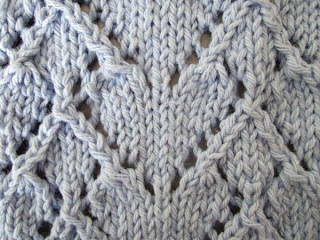 Yay, I actually did a little knitting today. 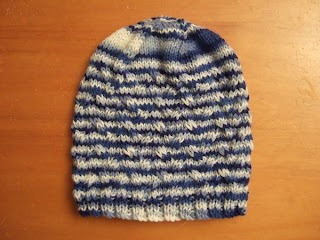 I cast on for a hat and knit about 1500 stitches... mostly while watching 3 hours of 24. DH's solution to all this is to get a MacBook Pro. He's offered to get me one for quite a while now. They certainly are attractive, but I fear the learning curve and the time spent to move everything over to the new platform, install new software, and get used to the Mac way of doing things. I suppose I should try to learn how to use my digital camera first? Have you read this article about what it's really like to switch to a Mac? It's an amusing read. I'm so lazy, I still haven't adjusted the time manually. If I hold out long enough, it will be the "correct" time again... yes? no? maybe? Thank you for all the feedback on pattern posting formatting. Flip flopping the positions of the pattern proper and the abbreviations. Looking into Libby's suggestion of creating PDF files. I already have Adobe Acrobat which comes with a PDF Writer, so I'm guessing I won't need to download/install CutePDF. The PDF file suggestion is looking very attractive right now. I think this will solve the problem Alice pointed out to me about printing the blog posts, where half the pages are for the pattern and the other half are comments to the blog post. I understand how this can eat up a lot of paper & ink. So PDF files look like a good solution for this. What do I do with the PDF files? I mean, where can I put them so that people can download them? 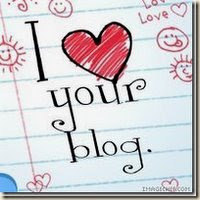 I don't think Blogger can do it??? 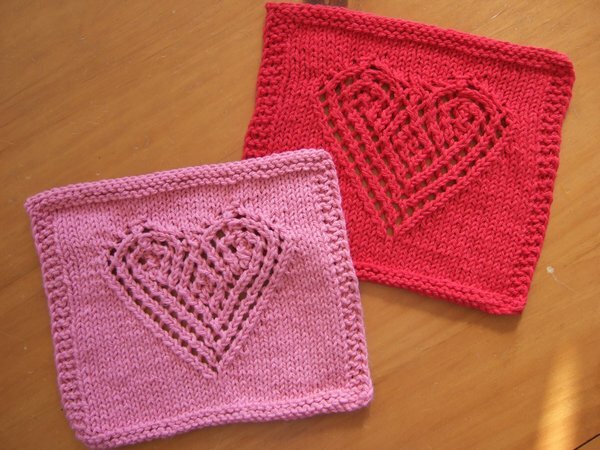 Allison wrote: Your heart cloth looks great! Are you going to post the pattern or have I missed it somewhere? Ok, time to get back to work. So far I've changed the sheets, dried/put away the dishes, washed more dishes, cleaned the bathroom, halfway through prepping food for M, and am working through 3 loads of laundry so far. Need to think about cooking something for DH's lunch. Still have more house things to do and a Costco run. And I need to wrap up M's birthday presents... this is the tricky part, since I want to do it on the coffee table but then she'll see what I'm doing. It'll probably have to wait until late at night when I'm too tired to wrestle with wrapping paper. What to make for dinner tonight? I'm thinking a simple chicken & spinach (possibly with french beans if I can get some today) stir fry. Original Instructions: In the list of books below, bold the ones you’ve read, italicize the ones you want to read, cross out the ones you won’t touch with a ten-foot pole, put a cross (+) in front of the ones on your book shelf, and asterisk (*) the ones you’ve never heard of. Well, since I can't figure out how to cross out text in Blogger, I will indicate the books I won't touch with a ten-foot pole by coloring the text orange. I've placed a question mark (?) in front of the ones I'm not sure whether I want to read or not. Feel free to let me know if there is a book on this list I should reconsider reading. I guess it is not quite as bulky as Reynolds Blizzard, however I might be able to substitute it in a pattern I meant to knit up with my 3 balls of Blizzard. Maybe? 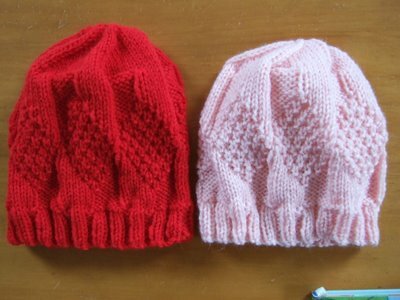 Left hat is the 3AM Cable Hat knitted with a fold-up brim. 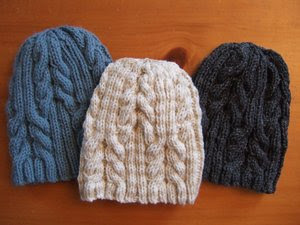 Middle hat is the 3 Cables Hat. 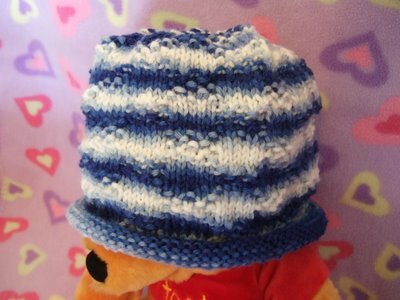 Don't you just hate how this blue variegated yarn stripes? 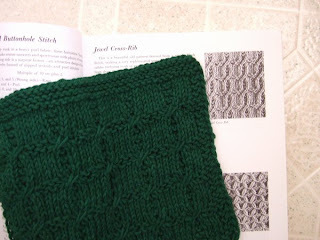 Well, I finally typed up the pattern to my Ariel Scarf (which I started typing up a couple months ago... yeah, things move slowly in this house, lol), but I can't post it until I figure out a better way to make my patterns more readable. I've been putting the pattern above the notes section which enumerates the abbreviations I use in the pattern. Apparently this list of abbreviations gets missed despite adding something to the effect of "Please read 'Notes' section at the bottom before starting" directly above the cast on instructions, and adding the blurb at the top of my blog underneath the blog title, "Patterns on this site may use 'Unorthodox' abbreviations, please read NOTES section of each pattern before beginning." 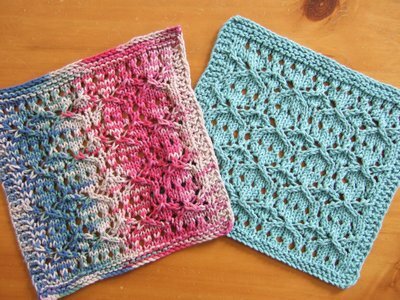 So I'm going to play around with rearranging the text in my Ariel Scarf pattern post, perhaps putting the NOTES section above the PATTERN section. I don't have a printer to print out my pattern to see whether any of it gets truncated. Does that ever happen to people? I'm also wondering if posts don't show up completely in some browsers. I use Mozilla Firefox and things look fine to me. But you never know. I know someone who upgraded her Blogger template and then all the text in each of her posts appeared centered to her, yet they all looked normal (viz. left justified) to me in my browser. So I know weird things happen in Bloggerland. Time for bed. I can't believe I'm losing an hour of my life this weekend... :-( I used to set my clocks before going to bed. Now I'm just too tired, it'll have to wait until tomorrow morning. 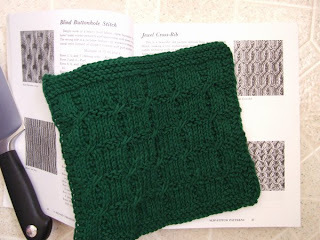 Zero knitting done today :-( , but we did manage to look at a few Open Houses today. ... or coincidence? Do you remember when I wrote about my last Elann order where DH had a "meltdown" at work and forgot to give me my little white box ASAIA? I had to wait 4 days (after it arrived) to get my box. Any guesses on when DH will actually bring my little white box home? I was in Noe Valley (a little neighborhood in San Francisco) on Tues and stopped by Pasta Gina on Diamond St (@ NE corner of 24th St) so M could have a veggie quiche for lunch -- it was delish, btw. You can easily miss this place if you blink. It is a very small Italian take-out deli type place, but they sure do have a lot of stuff inside their little shop. Fresh pasta & sauces. Lasagna. Ravioli. Olives. Meatloaf. Meatballs. Bread. Cannoli. Dry goods. It's take-out only, but there are two benches outside where you can sit to enjoy your meal. You must seek out this little gem the next time you're in the neighborhood. Afterwards we walked up the street to the small park at the NW corner of Douglass St & 24th St, where M played a little in the sand, the swings, & the slide. I think in a few years she will be able to play more independently at the park, so I can be like other moms with older kids.... sitting in the sidelines while the kids play. I'm thinking ... KNITTING TIME!!! However with my luck, there will probably be something which will preclude this from ever happening. 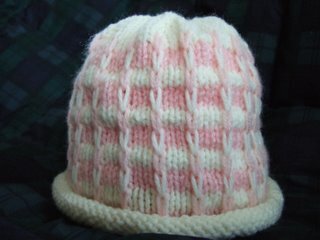 I've just discovered that Sue, for whom I made this chemo hat in 12/2005, is going to participate in this year's Avon Walk for Breast Cancer. Her webpage is here, if you're feeling generous about making a donation to someone you don't know. 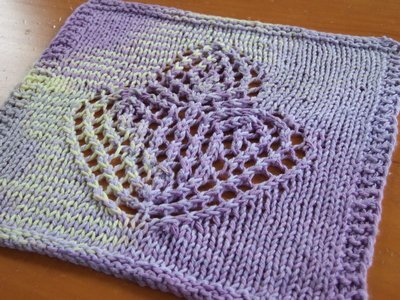 I mentioned the Eyelet Hearts Cloth I knitted, in my 2/20 post, where I cheated by tweaking the SSSSK triple decrease in Row 3 by doing: Slip 1, SSSK, PSSO. Don't know why this photo looks so grey to me. The yarn is actually blue! And the cloth hasn't been blocked ... haven't had the will power to do that simple task. Thank you for all the email inquiring about the Pampers codes, they've already been spoken for. I just need to get back to Madeline with the codes... I wrote them down on a slip of paper, now it's a matter of getting the paper & computer together. That was from a big box of 92 size 4 diapers, which will last me about a month I think, so those 2 codes should give 2.5 points each. I'll be offering more codes in the future as I am pretty certain I will be buying more diapers, pull up pants, or something. Yeah, I know I can collect the points myself, but I am really not interested in anything in their rewards catalog. I've received some great photos for the Readers' Gallery which I will try to post as soon as I can. Just a quickie post before Miss M wakes up from her nap. Ooooh, she was quite a tired little girl and fussed about getting into the car, but I discovered today that it is so much easier to "wrestle" her into her car seat with it forward facing. I was looking through this month's issue of The Irish Herald which lists lots of events for St Patty's Day, not that I would be able to make it to any of these events. However I noticed in one of the inserts, the St Patrick's Day Supplement, on page 3 (I guess, the pages aren't numbered, but it is the right side page after flipping the front cover), there is a photo of 3 cute litttle girls crouched around a dog. 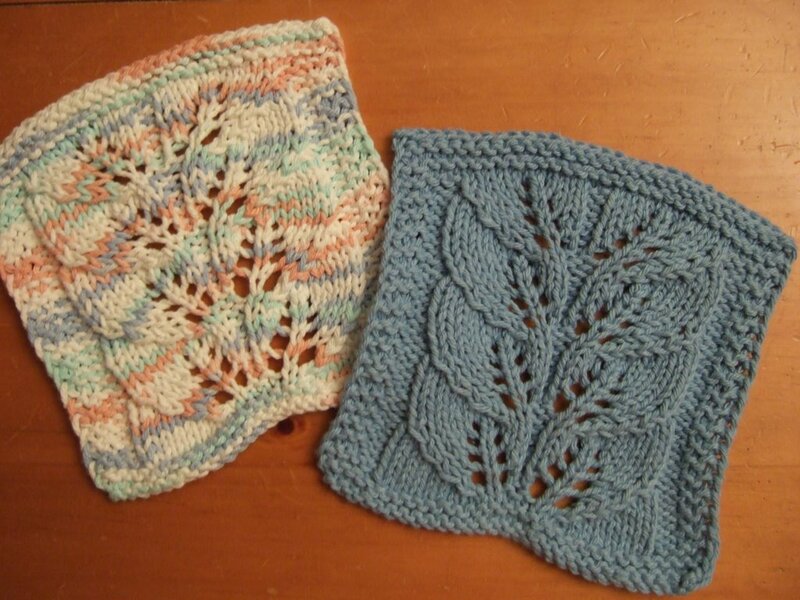 The girls are wearing these beautiful tams & cable sweaters; I couldn't help but think of Bets and her tams. Not sure exactly what I will do on St Patty's day, however I do know we'll be celebrating M's birthday. We haven't figured out the important details ... regular cake or ice cream cake? what flavor??? 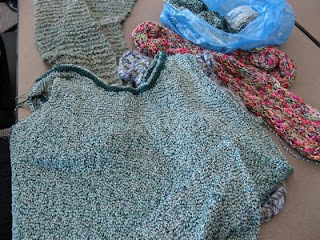 What happens when you knit with ugly yarn? 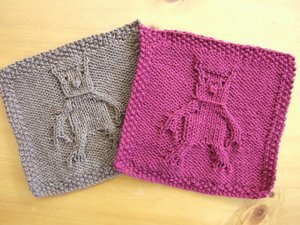 You get ugly knitted items!!! Yes, I'm still working on knitting charity hats with this big ball of yarn. I am so uninspired to knit with this because I hate the yarn. Everything I make with it looks the same! 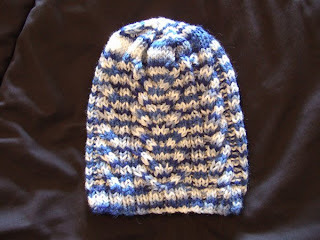 I've made 3 hats with this blue variegated yarn and they look pretty much the same from a distance. You can only distinguish their differences/pattern when looking at them up close. The photo above shows two of them side by side, as you can see they look quite unremarkable and you can barely tell they are two different hats. 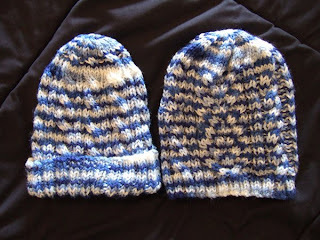 This is the hat on the left, my 3AM Cable Hat pattern. 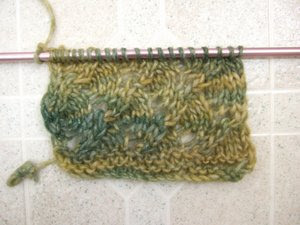 I worked about 2.5 inches of ribbing, then did 4 repeats of rounds 1 through 8, then worked the decrease. 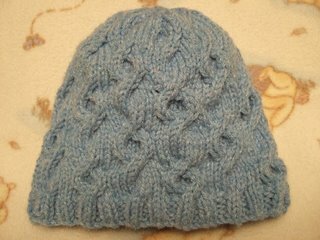 The other hat I knitted with this ugly blue yarn is my Quinquevulnera Hat, you can see a photo of that by clicking on this link. I think that's all the things I've knitted with this yarn. Gosh, I don't remember, but these are the only 3 hats I can think of. 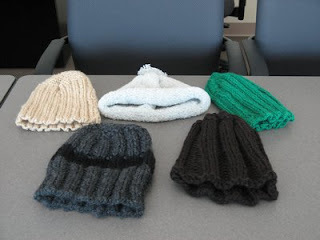 These hats will live their lives out as chemo hats for local cancer patients. 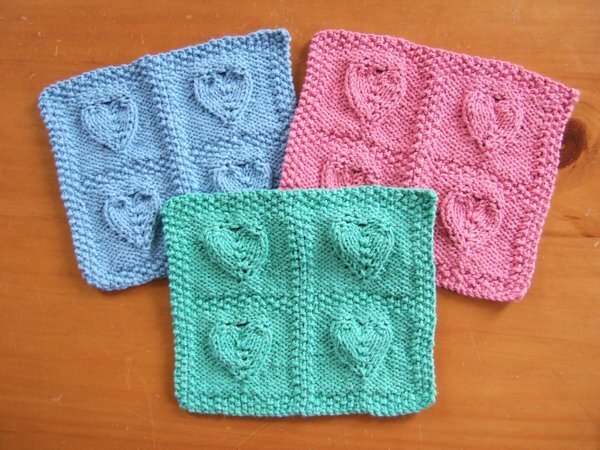 I knitted them for the Cap Karma Chemo Cap project. We've collected a bunch of suggested hat patterns on that site, you can check them out here. 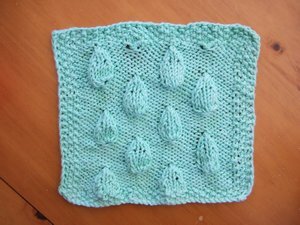 How much (or little) knitting have I done recently? I mentioned some stats here, and thought I'd give you a little update. Sat ... ~ 1,400 stitches. YAY! Sun ... 0 stitches so far, but it's still early, so we'll see. Any guesses? Sorry about the curled edges in the photo above, this has been rolled up in a bag for a while. That's Ariel. 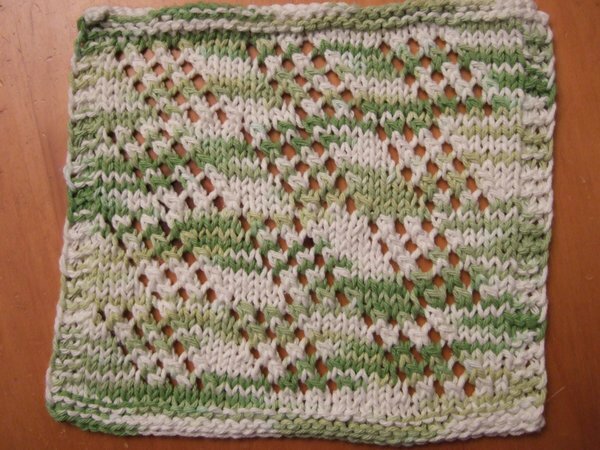 The color isn't quite right due to a nighttime bad lighting shot; the green is really not as dark. 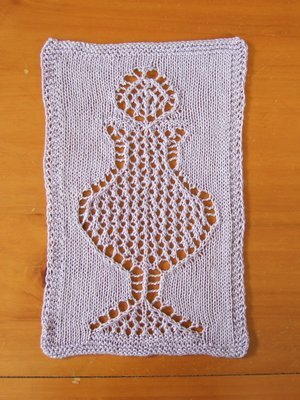 Well I guess now that I have finally taken a photo, I should go put that in my free patterns coming down the pike section of my sidebar ... I lack alacrity at times... lol. Things are always disappearing in my house... if it's not row counters, then it's wash cloths & hats, or M's crayons & hair clips. I KNOW I should have a couple dozen hair clips. I guess they get lost while we're out, hide themselves in the sofa or her car seat, and who knows where else. Hmm... hair clips disappear like ring markers, huh? I was vacuuming under the changing table and heard a crunching sound as I got to the very back ... I suspect that the vacuum snacking on one or two hair clips. So that's another place where hair clips go. Not sure the row counter would get sucked into the vacuum since they have a larger diameter. M loves hats. Sometimes she grabs the Swirl Hat I made for Cap Karma and wears it around the house. It's an adult small size hat so it fits loosely on her, but she still looks awfully cute in it. 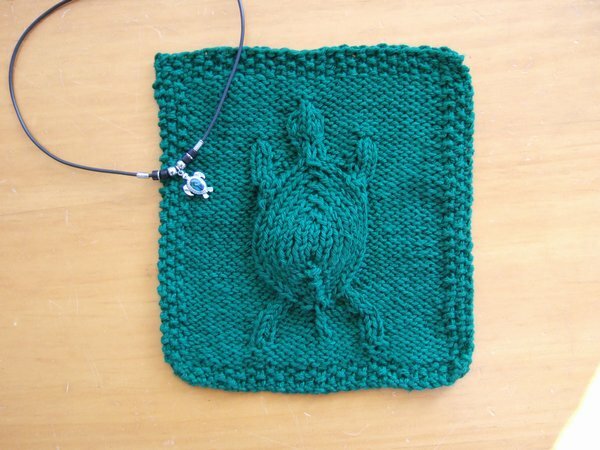 I am missing the dark green Embossed Turtle Cloth I made recently. 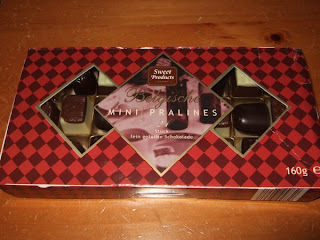 It was fortuitous to have gotten some photos for my blog post before it went missing. As for the crayons ... she has a propensity for hiding them behind one specific box in the dining room. Don't know what compels her to do this. Does anybody know what language this word is in? yabanci. And what does it mean? Wed ... 0 stitches. Yeah, yesterday wasn't productive at all. 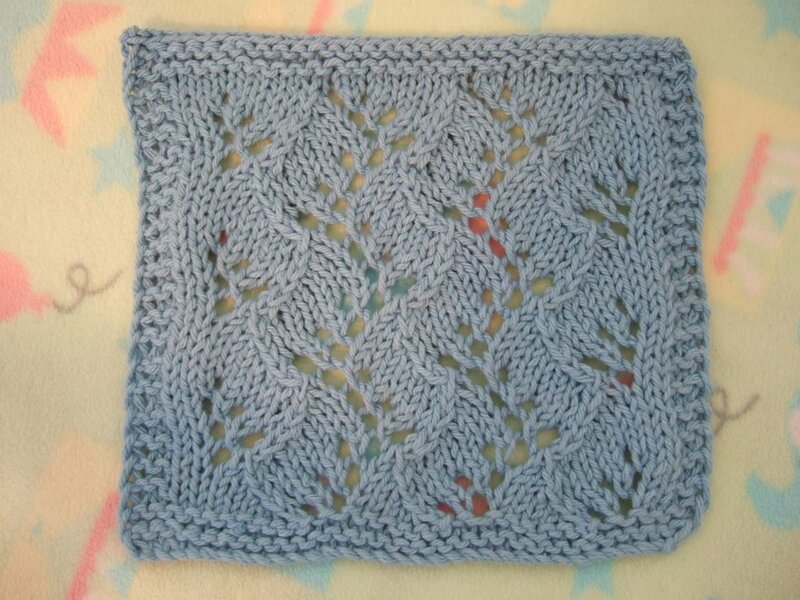 Thurs (today) ... 0 so far, but I might try to push some yarn around a needle later tonight. I did great on Mon & Tues. I know it doesn't sound like much to the average knitter, however I have to tell you that this is considered a huge amount for me.